HT01. 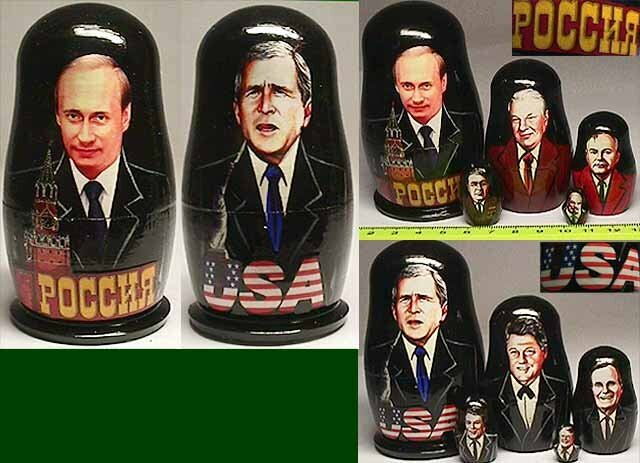 "Presidents" USA / Russia sets 5n 4"
Seller: Milleniums.org – Nesting dolls shipped from Moscow. These really uncommon Russian wooden nesting dolls "Presidents" (5 pieces) are made in a rather original style. The dolls portray Russian and American politicians. Interesting souvenir from Russia! The United States presidents George W. Bush, Bill Clinton, George Bush, Ronald Reagan and James Carter are depicted on one side of the dolls. The pictures of the Russian leaders V. Putin, B. Yeltsin, M. Gorbachov, L. Brezhnev and V. Lenin are on the other side of the dolls. In the pictures there are white light reflection spots for the dolls are coated with perfect lacquer finish.